Couture style! Perfect fusion of hot pinks and limes designed pave style (tight and compact) in a modern cube vase. These vases may not be tall, but they sure make a lasting impression! 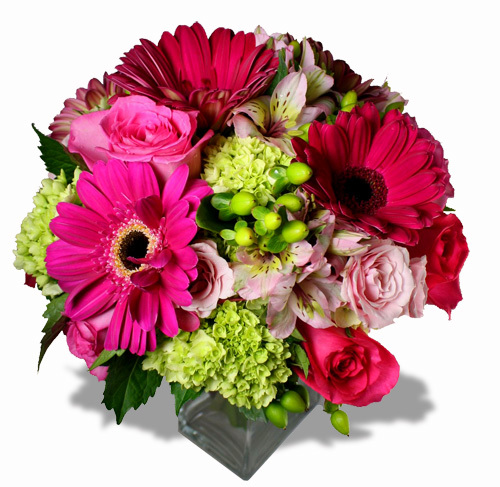 Gerbera daisy, hydrangea, hypericum berry, rose, etc. I have ordered this particular piece in the past and each time I send the recipient is thrilled with the results! Stunning display of color!! Belvedere is wonderful to work with. Great for the young at heart! There are so many varieties of flowers, berries and multiple colors mixed in, this arrangement will keep you smiling each time you look at it.